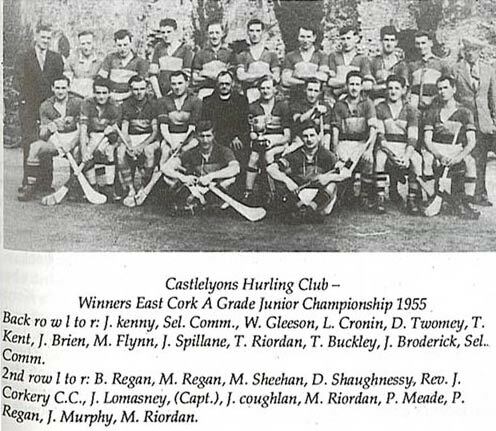 The first records of hurling and football being played in Castlelyons date back to 1887 when a team from the parish took part in the County Championships although it is believed the games were played in the locality long before this period. 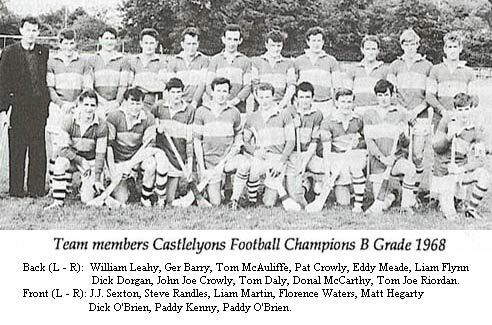 The area produced many great players down through the years playing at Inter-County and various other levels, mainly football. The Club became extinct in the early thirties due partly to political problems. The coming of Fr. 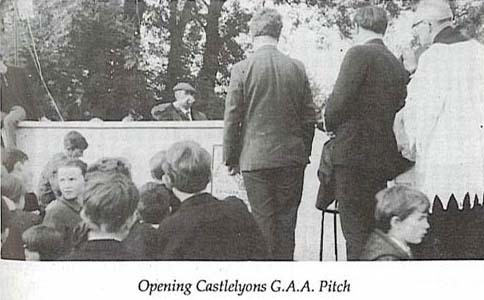 Morton (1935/47) to Castlelyons was a milestone in Gaelic activities. He had a great love of all things irish especially the game of hurling and it could be said of him that he was the man who brought hurling to Castlelyons as it is known today. He formed a Club and began teaching the game home self to many young men who wouldn't have seen a hurley until then, there being no juvenile games at the time. Sad to recall, the Club again went out of existence in the early forties. Although no Club existed, the games, mainly hurling, continues to be played at various centres, mainly Bawnard, Murphy's field, Bridesbridge, Morrisson's field and in front of the Abbey in Castlelyons. Hurling was also played at various other cross-road points according to relationships with the local farmer. There would usually be a challenge match between Castlelyons and Bridesbridge in the Summer and then a team picked from both to play Coolagown and Bawnard. These would be the only matches most of the lads would play for the year. 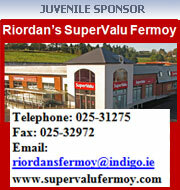 However, a few of the better players were playing with Fermoy and Bride Rovers. 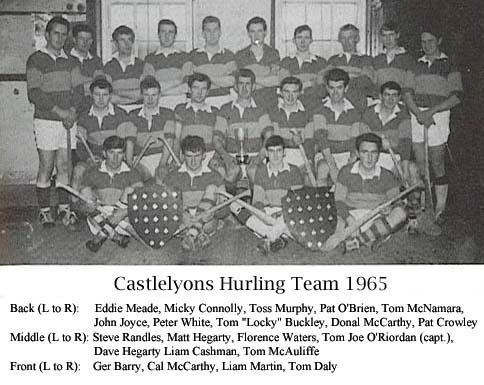 Local pride in the parish at that time was at a very low ebb, and although many bemoaned the fact that the parish had no club, most people believed that nothing could ne organised in Castlelyons. The main meeting place at that time was the corner in Castlelyons known as Verling's corner. Here the young men would meet in the evening and when one enterprising individual decided to do a count one night, he got as far as sixty! The bridge at Bridesbridge was also a meeting place. Here pitch and toss was the big thing and if you hadn't at least six pennies in your pocket you stayed at the back of the crowd. There were three pubs in Castlelyons Village at the time as well as one at Coolagown, on eat Bridesbridge, another at O'Leary's Cross and also at Waterpark, all much smaller than they are today. They were mainly frequented by older men. Young people and women were rarely seen in pubs in those days. It was a time when people looked after just their own affairs, with practically no community involvement. The appointment of Fr. Corkery to Castlelyons as C.C. from 1947-1963 has a profound bearing on the direction the parish took during the years that followed. From the outset he endeavored to insil a sense of pride in Family, Parish and county at a time when it wasn't fashionable to be preaching such a gospel. He called a meting to form a G.A.A. Club and after many of the "doubting Thomas's" had their say from the back , a Club was formed with himself as Chairman. The first match to be played was played in a field given for the day by the James Kent R.I.P. where forty houses are now built. Kilcronat (now St. Catherines) provided the opposition and a big crowd turned up for the occasion. Running a Club in those days entailed a great deal of work. There were very few cars, no phones and no Club-room. 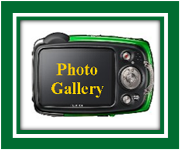 Some of the happenings of the time would take on an amusing slant when viewed from present circumstances. When a match was arranged for a Sunday afternoon, permission would have to be got from some farmer for a field. Goalposts would have to be erected and the field lined. Furze bushes would mark the corners except for Championship matches when flags would be used. The cow-dung would have to be cleared form the goal area! Permission to cut the grass in Summer time was always a contentious issue. On one occasion permission was refused, but "Ye may cut the thistles". Procuring goalposts was a highly skilled operation. Soundings would be taken from various members as to where grew the four tallest trees, mainly larch. This was before the chain-saw arrived and there were many more trees in the area. It would have to be established beforehand beyond any doubt that the owner would allow the trees to be cut. Otherwise the trees would have to be cut at night. The same flue applied for the cutting of ash for hurleys. Another amusing incident occurred during a match at Watergrasshill between Watergrasshill and Castlelyons on a wet evening. It was before the coming of the oil skin clothing and in order to keep himself dry this particular referee would put on several coats and as the outside one got wet and heavy, he would discard it. Shortly after the ball being thrown in to start the game, the Hill broke away and had the ball over the bar. It was then observed that the referee was searching for something in the grass, helped by a couple of players. More players joined in the search. A few more people from the sideline came in to see what was wrong and then more and more. Word finally got around that the referee has lost his pencil. This was before biros were invented and not one in the crowd had a pencil. Eventually the referee found the pencil himself in the pocket of his inside coat. The Hill players then reminded him to write down the point they had scored but he had not seen the score as the was searching for his pencil. Eventually the match got underway and was enjoyed by all. Transport to the matches was by lorry. This would take supporters and players. During the fifties the parish became sadly divided and it became difficult to keep the Club on an even keel. However, by remaining neutral and endeavoring to foster friendships the Club eventually had a uniting effect and harmony was restored. 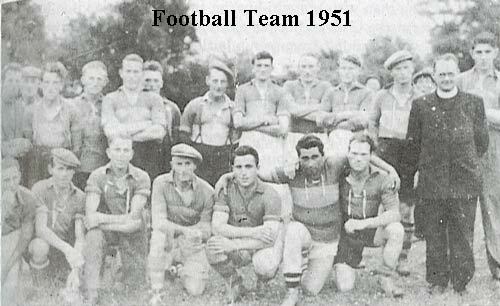 The Club had its most successful period on the playing fields in the mid-fifties winning the B Championship in 1953, beaten by a point in the A final in 1954 and winning the A Championship in 1955. The team beat Courcey Rovers at Cork Athletic Grounds, now Pairc UÃ­ Caoimh, in the first round of the county and qualified to meet Aghabulogue in the semi-final. This turned out to be a most controversial meeting. Aghabulogue won, but during the game word was received form the County Board that they were believed to heave several illegal players from Tipperary. Castlelyons were asked to lodge an objective and they would get the match. However, when the objection was heard, the attitude of the County Board was completely changed and the Club got a raw deal. Castlelyons proved that at least four of the Aghabullogue team were from Tipperary and were playing there, but as the Castlelyons list omitted one name, as one player was late for the start of the game and a substitute was put on as the team was going on the field, both teams were ruled out of the Championship. It was a shocking decision and relations with the County Board were strained afterwards. Castlelyons appealed the decision to Munster Council but they rules that as the address of the Secretary of the Munster Council wasn't written in Irish it couldn't be heard, even though it was copied from the G.A.A. Official Guide where it was written in English. It was a traumatic time for the Club and prominent members considered retiring from the G.A.A. for good as they felt they had been badly let down by the County Board. In the early fifties the Club rented a field from the Leahys of Abbylands. This was a great step forward, as it meant that goalposts could be left up, grass could be cut properly, so the standard of hurling improved considerably. In the late sixties a directive was issued to all Clubs from Central Council to endeavor to purchase a pitch of their own, The Club bought the present pitch from Mrs. John Kenny of Abbeylands in 1968. It involved major earth leveling as it sloped severely. The money was borrowed from the Bank, but the County Board offered generous assistance and also promise to send down the County Senior Hurling team free of charge if a match could be arranged. The official opening took place on June 6th 1971 and was performed by Mr. Pat Fanning, President of the GAA. There was match between Cork and Clare on the new pitch. It was witnessed by a huge crowd: it was a wonderful occasion and was great boost for the club Fund raising activities then commenced to clear the debt. Small grants were given by the GAA and Cork County Council. The major share of the funds needed were raised at local level and the debt was cleared in a short time. The Club then began planning to build dressing rooms. At the same time the local Community council was considering building a meeting hall as they were vacating the old school to make it available to the late Mr Jim Fleming to set up a clothing factory which gave much needed employment in the area. It was a time when the parish found itself at a cross-roads. To complicate matters more, a suggestion was made by people in Fermoy to build a huge complex to cater for the parishes bordering Fermoy and the town itself. Castlelyons the proposal, but felt it would be bad for community spirit. It was decided to call a public meeting in the old school to consider the feasibility of building a hall. Only five people attended the meeting. They decided to go ahead with plans to build dressing rooms and a hall to cater for all sections of the community on the GAA grounds. It was also decided to raise the money in the bank and to use voluntary labour as much as possible. A builder was employed by day and an army of voluntary workers would come along every evening. It was an exiting time in the parish and a period of wonderful community spirit. The entire building was completed in record time but a huge debt existed in the Bank. There were no Government or Lottery Grants at that time, so the money would have to be got locally. A cattle scheme was thought up whereby cattle would be bought at the mart and given to farmers who would already have agreed to take them for six months free of charge. The cattle would then be taken back from the farmers and sold at the Mart. This involved another visit to the now alarmed Bank Manager. The cost of buying the cattle was almost as much as building. However, after a lot of persuasion the money was made available and cattle were taken our to almost a hundred farmers form Coolagown to Britway and beyond. It was a wonderful scheme as it involved all sections of the Community, Protestants and Catholic, and brought in a huge profit. The scheme was continued for three years by which time, with other fund raising activities, the debt was cleared. The Community now had a complex, which it is believed was the first of its kind because it catered for all ages. Previous to this, Parish Halls were all that existed. A lot of thought went into putting a name on the building. Finally some one thought of Community Centre and it is generally agreed that Castlelyons Community Centre was the first to be built in rural Ireland. Many people came from outside areas to see the Centre and in the years that followed, most Clubs in East and North Cork and further a field purchased their own playing fields and began building indoor facilities. About this time many people felt that ladies were not adequately catered for in the new Centre. The Committee discussed the matter and visited many areas in the City to find a suitable game that could be played by ladies and gents, young and old. Finally, Squash was decided on and two Squash Courts were built together with a Members Bar. The parish now had its own playing field, meeting rooms, main hall for games, dances, concerts, plays, etc., a shop and dressing rooms with hot and cold showers, a big change from a few years before when players togged off by the side of a fence and only shower to be had come down from the sky. The Centre was officially opened by Mr. Con Murphy, with a senior Hurling match between Cork and Limerick and a free night for everyone that helped. Castlelyons is a place of wonderful community spirit.A lot of people have given hours and hours of dedicated work to make it a better place to live in. Many people who came to live in the area have enriched it by their coming and will be always welcome. The people who built these facilities have toiled for no reward. All they would ask is that they be used to the fullest and be always respected. People in Castlelyons draw inspiration from wonderful leaders who graces the parish down through the centuries. The suffering and sacrifices made by Fr. O'Dwyer and Fr. Ferris in their fight for the rights of the poor of the parish must be always remembered. The work of An-tAthair Peadar in the restoration of the Irish language during his stay in Castlelyons is believed to have kept it from becoming extinct, when forces were arrayed against it. The Battle of Bawnard is believed to be the spark that inspired the County to continue the struggle for freedom when 1916 seemed a failure. Castlelyons has a glorious tradition to love up. The people that went before us blazed a trail that will be difficult to follow. Let us endeavour to live up to their expectations with a constant effort at caring and sharing with one another.